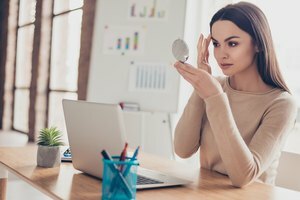 Many women face the inevitable struggle that their makeup smears at a certain time of the day -- it simply won't stay in place. This can even happen with a reputable makeup brand like bareMinerals if you don't take certain steps to prevent it. The trick to a lasting payoff is to correctly prep, prime, apply and finish. It's very important when using bareMinerals -- or any makeup brand -- to prep your skin. Prepping gets rid of excessive oil and dirt that could ruin your makeup. Cleanse with a gel cleanser if you have oily or combination skin or a cream cleanser if you have normal or dry skin. Moisturize with a moisturizer suited to your skin type; for example, a moisturizer may be labeled to help with acne-prone skin or be best for dry or normal skin. Apply a little bareMinerals Renew & Hydrate Eye Cream by dabbing the product around your eye with the tip of your ring finger. Refrain from exerting too much pressure as you do this. Wait a few minutes for your moisturizer to absorb into your skin before applying primer makeup. BareMinerals has several face primer and eye primer makeup options. Primer helps to absorb excessive oil, smooths out pores and will assist with keeping your makeup resistant to running. Select primer that controls oil if you have very oily skin. If you have patches of discoloration, choose a primer that helps combat uneven skin. For dry skin, find a primer that works for dry patches. Face Primer: To apply face primer, use only a dime-size amount of product. Smooth it over your face with your fingers or a makeup sponge. Eye Primer: Take a pea-size amount and dab it all over your eyelids with your fingertips. Lips: Adding either a lip primer or a lip balm on your lips will prep them for lip color. To apply bareMinerals foundation to make it last, tap a foundation brush into the product; do not swirl the brush in the foundation. Sweep the brush across your face. Add as much as you need for full coverage. 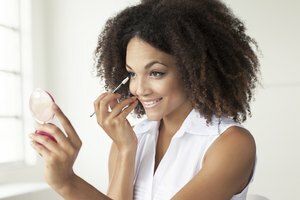 If you apply a bareMinerals bronzer or blush, use the same "tap and sweep" technique. For bareMinerals eye makeup that has consistent color and vibrancy all day, use an eyeshadow brush to dab into your eyeshadow. Tap your eyeshadow onto your lids rather than just sweeping it on. This tapping motion helps adhere the eyeshadow onto the eye primer, holding the color in place. Ensuring that your lipstick doesn't feather can be difficult. Apply lip liner on the outline of your lips and all over lips to assist with holding your lipstick in place. Use a lip brush to smoothly apply a lipstick onto your lips. If you desire a matte look, blot the lipstick with a tissue. To add shine, use a lip gloss. Professionally designed brushes are the best to use when applying your makeup for a lasting impact. BareMinerals Mineral Veil finishing powder can keep your makeup long lasting. Apply the finishing powder over your foundation with a fluffy foundation brush. Place a tissue over your lips, then apply the finishing powder over the tissue. This will add just a touch of the powder over your lipstick to help hold it in place without looking powdery. If you want to use the bareMinerals finishing powder for your eye makeup, brush it onto your lids before eyeshadow to protect your eyeshadow from oiliness.